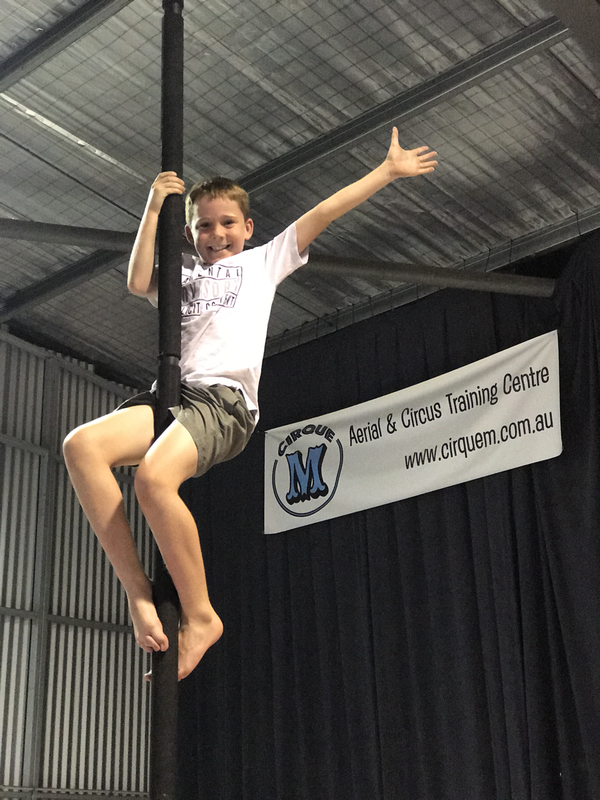 "Not my Circus not my monkeys" as the saying goes... Cirque M is happy to have your little Monkeys these school holidays! Cirque M will be running 4 holiday programs throughout the year. They cater to ages from 5-13yrs. In the Cirque M School Holiday Workshop the children will be doing a range of activities each day in our school holiday workshop. We will cover warm ups,stretching, games, aerials skills, ground skills, hula hooping, juggling and much more! We have 2 instructors minimum so for those kids that have been before.. we will aim to add onto what you know.. and if there are new kids on the block, then we show you the ropes as a beginner. We have 2 groups operating from 5-8 years 9am-12noon and then from 9-13 years 12:30-3:30pm. Prompt drop-offs and pick-ups are greatly appreciated, as they help us run smooth workshops and get the space ready in between groups much more efficiently. If you have kids attending both sessions, you may drop your older child up when picking up your youngest child. If your child has any particular needs, we are very accommodating and are happy to discuss things earlier so that we can prepare the best program possible. If you book please check all your inboxes to make sure you receive your confirmation email and welcome letter. If you don't, let us know immediately so that you get all the info you require! Comfortable clothing the kids can move around in. T shirts and footless tights are great or t-shirts and spare tracksuit pants are good. Any small cuts or abrasions covered with bandaids prior to class. Any personal medication required for allergens such as epicene or puffer. Please let the staff know of its whereabouts in case the need arises to use them. If you are putting more than one sibling into the course, enter the discount code to receive your discount. Save $5 per child! Please note: No discounts are in conjunction with ready set go discount. This is a stand alone grant contribution. The most important rule of Cirque M... is to HAVE FUN! Meet Will! 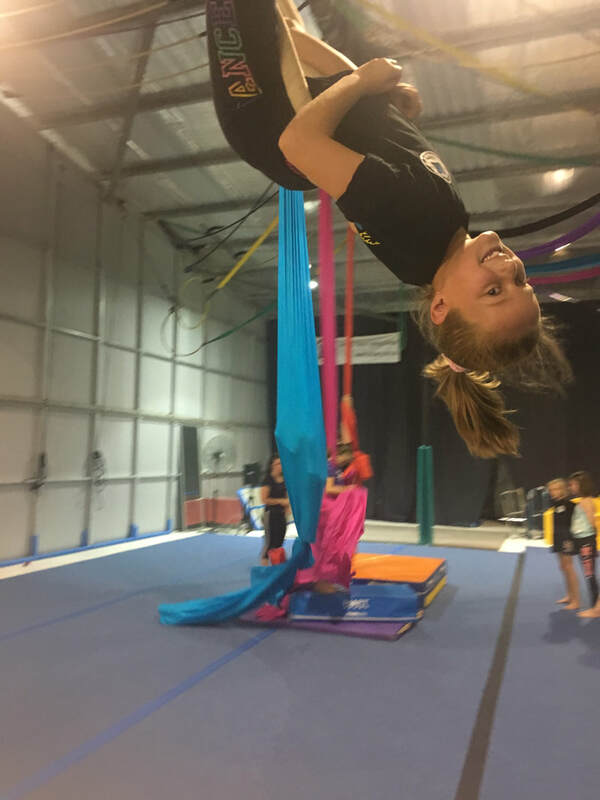 Just one of our regular students (5-8 years) just hanging around! 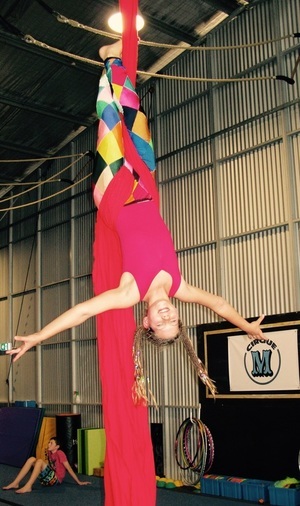 The beautiful Ruby living life upside-down at Cirque M!